This Sunday I am going for High Tea at the Beautiful and Historic Royal York Hotel in Toronto. I have been to this hotel many times in my life (staying there a couple of times with my family before I moved to Toronto) and every time I’m blown away by its grandeur. It truly is a sight to see when visiting Toronto, a vintage lovers dream. 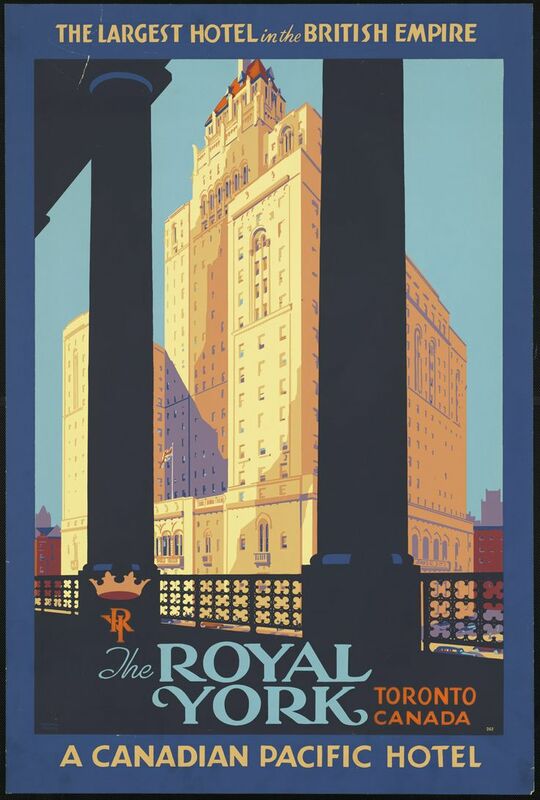 The Royal York opened it’s doors on June 11, 1929. It was the tallest building in the British Commonwealth and quickly set the hospitality standard of the day. The magnificent hotel became known as a city within a city, rising in 28 floors of architectural splendor and replete with mechanical genius and opulence never before seen in Toronto. It boasted 1,048 rooms – each with radios, private showers and bathtubs. The 1.5 acres of public rooms included a 12-bed hospital, 12,000-book library and ten ornate passenger elevators. The Concert Hall featured a full stage and mammoth pipe organ weighing 50 tons, which surpassed anything else in Canada with 300 miles of copper wire. There was a glass-enclosed roof garden, the largest hotel kitchen in Canada with a bakery that could produce over 15,000 French rolls a day, a 66-ft.long switchboard manned by 35 telephone operators, its own bank and golf course (now known as St. George Golf & Country) (Source). Thank you to the Fairmont Royal York for finding this AMAZING sketch of the fashions wore during the opening Gala Ball on June 11, 1929. I will take…all the outfits! Below is a sketch of the Royal York Hotel ballroom, clearly in the year that it opened from the outfits I see. 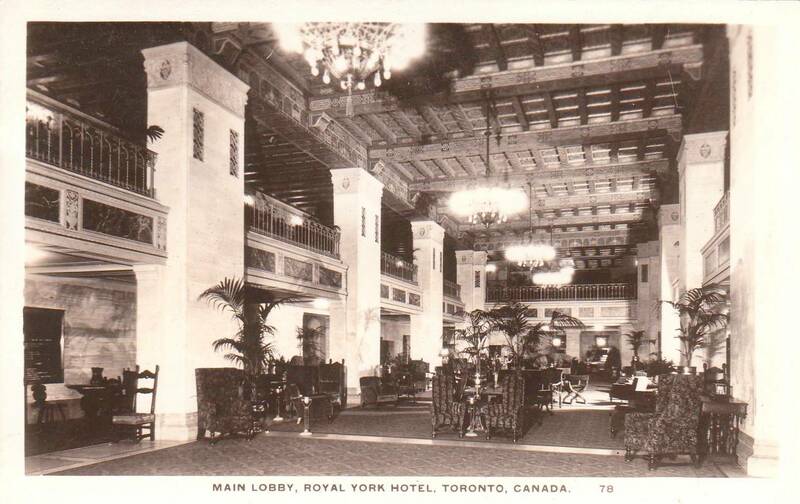 When the Royal York hotel opened its doors on June 11, 1929, it brought about a new social era, attracting a true “who’s who” list of royalty, celebrities, dignitaries and leisure travellers to the city of Toronto. On opening night, the Royal York hosted four grand balls where guests dined and danced until the wee hours of the morning. It set a new standard in luxury, elegance and entertainment. The Ballroom looks exactly like it did when it first opened-Stunning! The Hotel did everything top-notch. 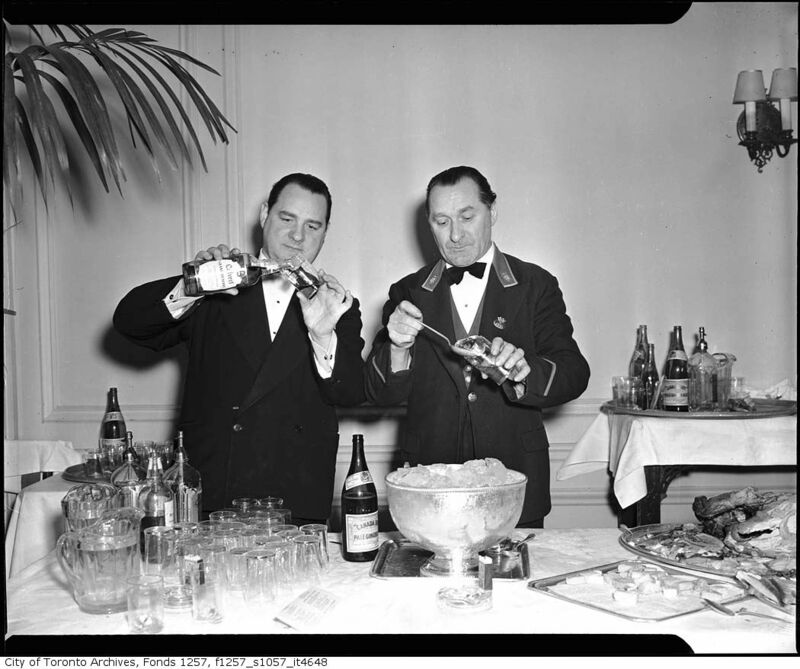 Look how stylish the Bartenders look in the 1940s? I wonder what they are making, it looks delightful whatever it is. What a Buffet! Can you see the Ice Sculpture Deer in the background? I love fun details like that. Image of the 66 foot long telephone switchboard that required 35 operators to run it. Of course a hotel on this grand of scale also had to have amazing entertainment. The Imperial Room was once the most sought after show room in North America, when it opened in the hotel in 1929 it was the city’s newest and most elegant dining and dancing establishment. 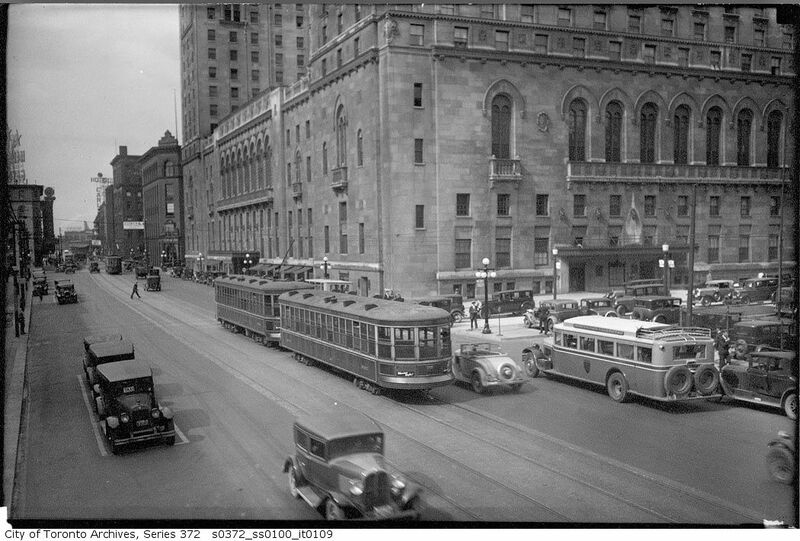 It defined the Toronto social scene as the meeting site of high society functions and big band shows. The stage of the Imperial Room has seen headlining acts such as Peggy Lee, Ella Fitzgerald and Bob Hope. The early bands often were employed by hotels, and many bore their employers’ names, eg, in Montreal, the Windsor Hotel Orchestra and Andy Tipaldi and his Ritz-Carlton Orchestra. The largest hotels in Canada had successions of orchestras which, by the 1950s and 1960s, also came to be used as showbands to accompany individual performers. 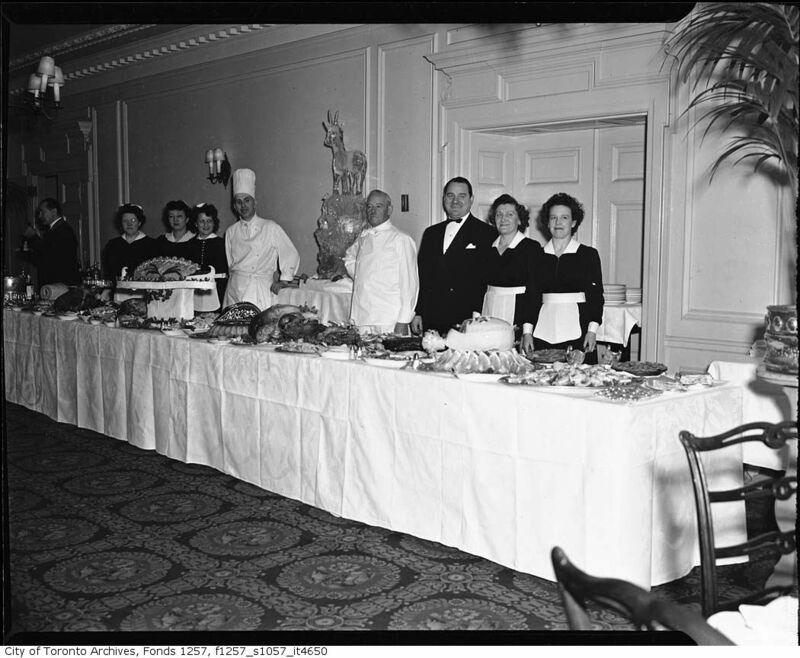 Leaders at the Royal York Hotel (Toronto) have included Charles Bodley, Fred Culley, Rex Battle, Don Romanelli, Billy Bissett, Horace Lapp, Stanley St. John,Moxie Whitney, and Howard Cable (Source). The band below is clearly the house band of the Royal York as the signs say “RY”. What kind of music do you think they are playing if the first row is all Violins? Guests from all walks of life stayed at the hotel, like Bob Hope, Cary Grant, Frank Sinatra, Gene Kelly (swoon) and even….Queen Elizabeth II (seen below). 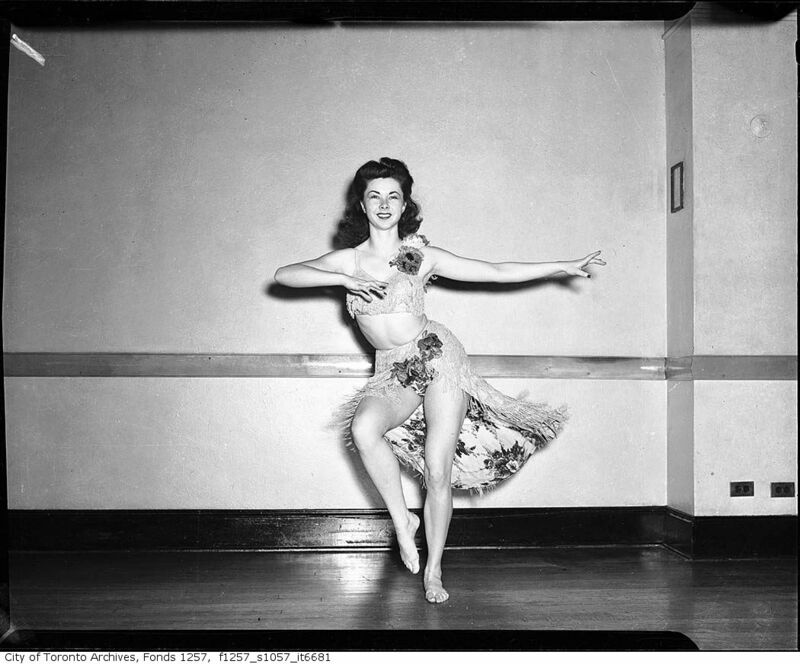 Here is an adorable image of an Ice Follies performer in the 1940s who was staying there. How cute is that outfit?? Royal York also had various advertising campaigns over the years. Here are some great vintage ads. I adore this cute early 1960s ad (I think) for their meeting rooms. Reminds me of a Mad Men episode. Looking to get married? The Royal York I will do the job nicely. This ad is clearly from the same illustrator as above, love it. 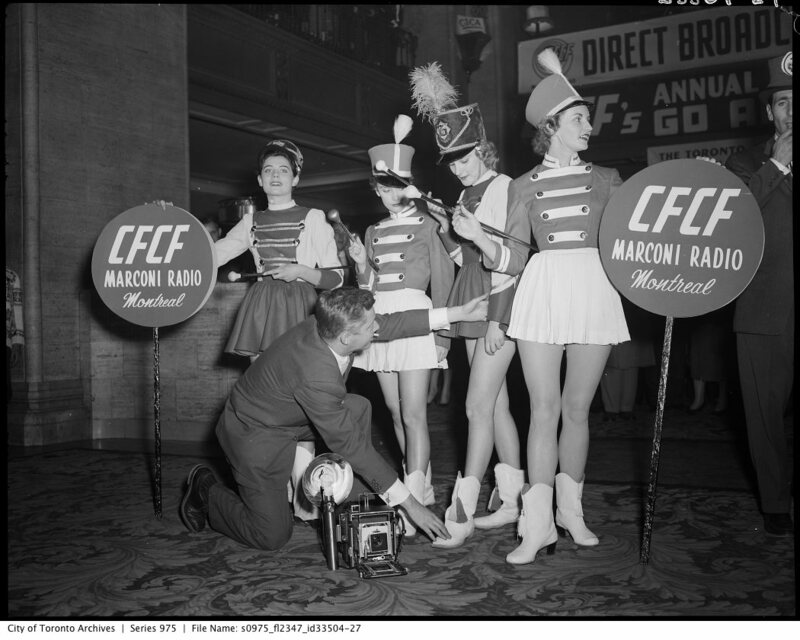 The Royal York has even hosted fun events like this Direct Broadcast party of the Grey Cup (superbowl of Canada) in November 1956. Many clubs and companies hosted events at the Hotel over the years, like The Electric Club from the 1930s-50s. Who apparently liked their menus to have pretty girls in swimsuits on the front (and lassie). After looking thru all these photos, reading stories on the Royal York I’m thrilled the Fairmont and Toronto has seen value in keeping it standing after all these years because this truly is a fantastic piece of Toronto History. So Friends..have you been to the RY? 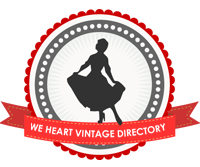 Or do you have a favorite vintage hotel? Do Tell! Those outfits were tailor-made for a tall lady like yourself! The wedding card is so cute, I wish I could actually own it. I love the RY and you will looove having High Tea there! I could die for that Ice Follies pictures…the outfit is the cutest! Ooooh, your history filled posts are always huge favourites with me. Awesome look back at this iconic, well known Toronto landmark. I always loved passing it when we lived in the GTA, but can’t claim to have been overly well versed in the particulars of its storied history – until now. Thank you for the wonderful, informative lesson, dear gal. Thanks so much Jessica, the history posts are one of my favorite to put together because I always learn something new. Something I did not post (and I’m going to edit it) is that the Royal York actually was the tallest building in toronto for 35 years after it was built. Hard to imagine looking at the skyline today. What a fantastic hotel! I always enjoy a journey back in time. Thanks so much for sharing!